The young person is sobbing in the WhatsApp audio message, speaking from Barrio Sandino in the Nicaraguan city of Jinotega. 'Three young people were killed here just yesterday,' they say, breathing in sharply to steady their voice. 'They had been fighting the Nicaraguan police.' Before hanging up they ask me not to name them in my story due to fear of repercussions. At its height in the 1980s, the international solidarity movement for Nicaragua had thousands of supporters, including many in Australia. The Central American nation was undergoing severe repression at the hands of dictator Anastasio Somoza. Hopes for peace, justice and democracy were embodied in the Sandinistas, the rebel socialist movement in which current Nicaraguan president Daniel Ortega was a leader; fighting the Somoza regime before it fell to the Sandinistas in 1979 as well as the 'contras', the US-backed army of insurrectionists trained by the CIA with the explicit aim of destabilising the new Sandinista government. In these years the Nicaraguan people's struggle for freedom inspired members of the solidarity movement to travel to Nicaragua to provide aid, to raise funds bound for the local effort to rebuild the country in the image of peace and socialism, and to place pressure on their governments to act in Nicaragua's interests. Fast-forward around 30 years and a Nicaraguan rebel movement is again calling for international solidarity as its members face repression from their national political leaders. But this time, Daniel Ortega is on the government's side. He's being held responsible for repressing peaceful public protests and refusing to enable new democratic elections. In recent protests against the Ortega government it is estimated that between 250 and 300 people were killed by police or paramilitaries. There are credible reports that paramilitary forces backed by the Ortega administration have been pursuing and killing citizens believed to be engaged with the opposition movements. 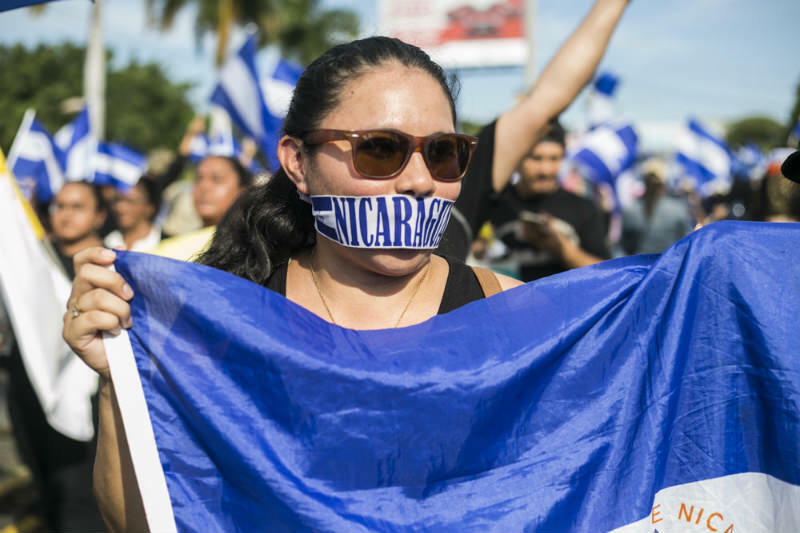 The hashtag #SOSNicaragua is all over social media and corresponding rallies have been held in cities across the world. At one such event in Mexico City last week, I met Lisaura, a young woman from Nicaragua whose family remains in their home country. 'A defenseless people is being attacked with high caliber weapons and the government has the cynicism to say they are not responsible,' she said, her face radiating worry for her loved ones. So, what does solidarity with Nicaragua look like today? 'The international community can only help with a problem that must be solved by Nicaraguans,' Juan Sebastian Chamorro, the director of the Nicaraguan Foundation for Economic and Social Development and member of Nicaragua's National Civic Alliance for Justice and Democracy, told CBS News last week. Nicaraguans, he said, will keep up the protests and pressure on the government 'to finally find a peaceful and democratic solution'. The Alliance is pushing for Ortega to step down to prevent further violence. Lisaura and her countryman Chamorro speak to the demands of international solidarity in 2018 in an epoch that is in many ways markedly different to that of 1979. The shape of international solidarity with movements such as Nicaragua's has been changed by the vicissitudes of the regional and international political order, the growth of mass and social media, and the analytic benefits of hindsight. The Catholic Church is mediating government violence and supporting the citizenry in the ways that it did in Nicaragua in the 1970s and 80s (as well as Guatemala, El Salvador, South Africa, the Philippines, East Timor, and others) but its moral authority struggles against the ongoing revelation of the global, systemic sexual abuse of children in Catholic church communities. Socialist internationalism has also faced revelations of gendered violence and a distinct reduction in capacity to challenge or capture state power. As such structures for analysis and organising have fallen away. Activists who might today ally themselves with the people's opposition in Nicaragua will also be aware of the vigorous critiques of solidarity movements: the fetishism of 'revolutionary' 'Latin American' people's movements by idealists in the Anglosphere and the many past failures to account for multiple interests, historical complexity, and white Anglo complicity in so-called 'third world' struggles that demand solidarity. Lisaura is one of many young people of Nicaragua who are raising their voices inside and outside their country. Writing in online publication Remezcla, Gabriel Perez Setright says, 'I left Nicaragua about a month ago, with plans to return in mid July. But now I don't know when or under what conditions I'll return to my country.' He says it is too dangerous to return to his pro-government neighbourhood and vows to fight for a free Nicaragua from a 'temporary exile' in LA. Further #SOSNicaragua rallies are planned for cities across the world, with young Nicaraguans speaking to the world through social and mobile media and Nicaraguan civic alliances speaking directly to the nightly news. They are redrawing the lines of international solidarity, into a shape we must hope will help to bring a more lasting peace to the Nicaraguan people. Original quotes from Lisaura and anonymous WhatsApp caller in Spanish, English translation by the author. Ann Deslandes is an Australian freelance writer who lives in Mexico City. Tweet her at @Ann_dLandes and read her other work here. Why is Nicaragua not like Costa Rica? In fact, why are Nicaragua, Guatemala, Honduras and El Salvador not like Costa Rica? And when was the last time the US felt threatened enough by Costa Rica to involve itself in local politics? Eureka Street should commission someone to tell us why the sanity and balance in Costa Rica since the 1940s was not replicated in its near neighbours. There is nothing Neoliberal about N government. Indeed it is the exact opposite. The original socialist “money for all” promise and has ended with a totalitarian government.....now the students propose a a better socialist model..... how comforting. N is a great example of what happens when you nationalize resource assets with a promise of a “fair” outcome for all ... underinvested, undercapitalized and ultimately unable to produce and make any money. Roy makes excellent comparison. Roy, why is Papua New Guinea not like Australia? Thank you for this informative article, Anna. I was one of those Australians in the 1980s who welcomed the victory of the Sandanistas over the repressive Somoza regime. I also opposed the US supported Contras that committed terrorist acts and human rights violations in Nicaragua in an attempt to overthrow the Sandanista government. The US policy was known as the Iran-Contra Affair and also referred to as Irangate, Contragate or the Iran–Contra scandal. It was a great political scandal in the US during the the presidency of Ronald Reagan. US officials secretly facilitated the sale of arms to Iran, which was the subject of an arms embargo. The current protests in Nicaragua have been sparked by draconian pension cuts mandated by the International Monetary Fund (IMF) . We must never forget how often the dictates of the IMF, the World Bank and US policies lave on the poorer nations in the Americas and elsewhere. However, it has been acknowledged in the international progressive media that the Nicaraguan Government policy towards protesters has been excessive. According to Gioconda Belli, a former Sandanista, Daniel Ortega and his wife,and vice-president, Rosaria Murillo, after 25 years of living together, they were married by Managua’s cardinal and former nemesis, Miguel Obando y Bravo. Miraculously, the couple went from being atheists to fervent Christians evernight. The illusion worked. as they were both elected. https://www.theguardian.com/commentisfree/2016/aug/24/nicaragua-dictatorship-sandinista-ortega-murillo People who worked in solidarity with the Sandanistas in the 1980s need to remind the Nicaraguan leaders that they will lose international support if they use brute force and violate human rights. Thank you for this informative article, Anna. I was one of those Australians in the 1980s who welcomed the victory of the Sandanistas over the repressive Somoza regime. I also opposed the US supported Contras that committed terrorist acts and human rights violations in Nicaragua in an attempt to overthrow the Sandanista government. The US policy was known as the Iran-Contra Affair, the support for the This was After a month of protests sparked by draconian pension cuts mandated by the International Monetary Fund (IMF) in Nicaragua, the Inter-American Commission on Human Rights announced in its preliminary report that there have been 76 killed and more than 800 injured from “indiscriminate” use of live bullets and other repressive methods by the state forces and “para-police” shock groups. Dozens of others are missing.